Finnish knife, nice condition. Old, some wear and marks of use are present. The bone is stained, and the belt loop has been replaced with copper wire instead of steel. 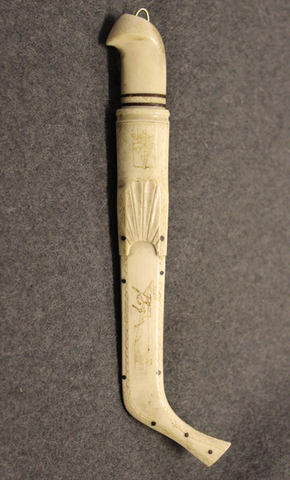 This specimen in has engravings on the bone scabbard, there is manufacturers signature in the blade, Johannes Lauri, Rovaniemi, on the back of the scabbard there is Mui. 1927 engraving that would mean souvenir 1927. Johannes Lauri moved to rovaniemi in early 1920´s he established his legendary knife shop in 1924, J Lauri Knives are most sought after collectibles.